1. It’s faster than cooking the turkey in the oven. The last time we smoked a 14 lbs turkey using the below method, it took a little over 2 hours. It would take twice that long to cook it in the oven. 2. It’s more likely to be moist. Between the steam and smoke and constant temperature control, it’s hard to dry out a smoked turkey. 3. It has a lot of flavor. Smoke penetrates throughout a turkey, even down to the bone, in a way that a rub on top of the breast will not. If you’re one of those people who thinks turkey is bland, this method is for you. To smoke a turkey, you will need a smoker. I recommend getting one. You can do all kinds of cool things with it, like make smoked salmon or your own bacon or kickass ribs or a host of other impress-your-guests dishes. For the heat, we use a combination of charcoal briquettes and wood. 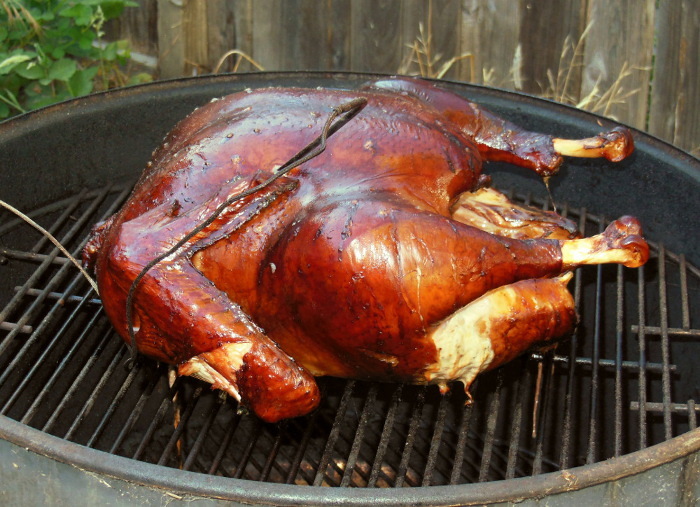 You can use any fruit wood to smoke a turkey, such as apple, almond, or cherry. We used pecan wood. For a more smokey flavor, you can use mesquite or hickory. As for the briquettes, Mr. Savvy recommends a briquette that doesn’t have any additives, like Kingsford Competition Briquets. Thaw the turkey as you normally would. Apply the rub of choice to the turkey. We used salt and pepper. Put one or two Chimney starter’s worth of briquettes in the smoker, along with a few chunks of wood. Put about a dozen briquettes in your Chimney Starter and light them. Once they are red hot, dump them on the unlit coals and assemble your smoker. Add the turkey, breast side up. Put a thermometer in the deepest part of the breast. Put a pan of water in the bottom of the smoker. This allows you to collect drippings for gravy, but more importantly, it adds a steam element that both speeds up the cooking, adds moisture to the bird, and helps regulate the heat. 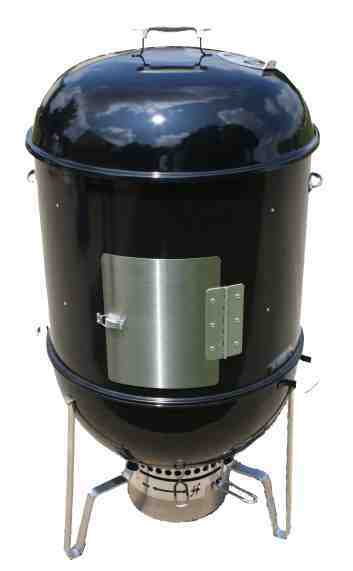 Let your smoker’s reach between 325-350 degrees. Monitor the temperature of the turkey carefully. When your thermometer says the turkey breast is 160-165 degrees or the thigh is 175 degrees, it’s done. Hi, happy Thanksgiving to you! Your turkey looks delicious and smoking sounds like a lotta fun, but the scientist in me has gotten curious: do you have an idea, why smoking the turkey cooks it faster than roasting it in the oven? I’m assuming the smoking and roasting temperatures would be approximately the same? Caramelia, good question. There are two things contributing to this. First, there are two heat sources cooking the turkey, the smoke and the steam from the water, which leads to faster cooking time than an oven, which just uses hot air. Secondly, water is a more efficient heat conductor than air. Hope that clears it up!